The Commando team, as well as managing to publish 104 issues of the comic each year, have been using the official Commando Comics Facebook page to give some behind the scenes info on their titles. This includes some of the preliminary sketches for their covers. 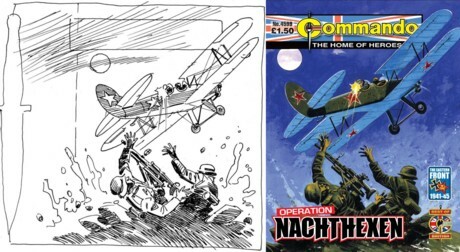 Writer Mac MacDonald covers a wide range of war themes for Commando but these two issues both featured aerial warfare and were assigned to artist Carlos Pino who provided both the internal B&W line art and the colour covers. 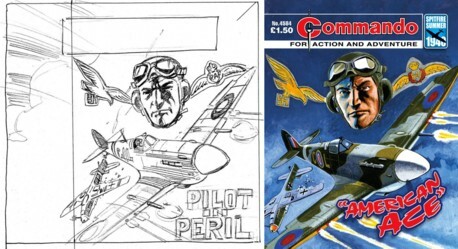 The first image featured here shows how the title of a given issue of Commando can change even at the last moment as Issue 4584 started off as "Pilot In Peril" before becoming "American Ace". He stepped off a US freighter in Liverpool and walked straight to the nearest RAF recruiting office to join up. A natural pilot, he was at the controls of a British fighter in no time. As his score of victories mounted in the summer of 1940, his fellow pilots never dreamed he carried a secret - one that, if discovered, could be his death warrant! The German forces that invaded the Soviet Union had much to fear once the Russians' fightback got into its stride. For the Russians are fearsome warriors when roused. What the Germans feared more than anything was the night. For that was when the Nachthexen - the night witches - flew. Because, you see, when the Nachthexen flew, they carried death on their wings. • There are more details of Commando titles on their official website, www.commandocomics.com, and Facebook page. downthetubes is pleased to offer a discount on a subscription to DC Thomson's Commando comic, entitling readers to save 50% by ordering using our special discount code! Follow this link to DC Thomson's subscription page. When prompted, enter this unique code COMDT - then make your payment and your subscription will be up and running. The price quoted offers a 50% discount for three months at £12.50. That’s £68.50 off the shop price. Please note, although the offer is not restricted to UK delivery (you need a UK bank account), the price increases for overseas delivery although the offer of 50% discount for three months is the same. * Saving based on discounted Direct Debit price compared with shop price. First quarterly payment discounted by 50% at £12.50 and £25 per quarter thereafter. UK bank accounts only. One year discounted subscription rate of £99. Gromit gets "Beano-fied" in a good cause!